After living in the Boston area for nearly my entire life, I’m amazed at how much I’ve failed to discover. Call me a creature of habit, but the routine of my daily commute tends to reduce my Boston bubble to the downtown area, the Financial District, and parts of Cambridge. Don’t get me wrong – that gives me a plethora of fine bars and restaurants to choose from, but there are some areas outside of that radius that just seem completely foreign and distant to me. Case in point: the Waterfront District. Sad but true – I barely even know what’s over there. I just tend to think…the waterfront, the World Trade Center, the train station…and um…some other stuff? Maybe it’s because I never have a reason to be in that part of town, but right or wrong, my impression has always been that it’s kind of a no-man’s land. It turns out, I should get over there more often. My friend John and I recently braved those daunting two stops on the Red Line, from Park Street to South Station, and went to TRADE. 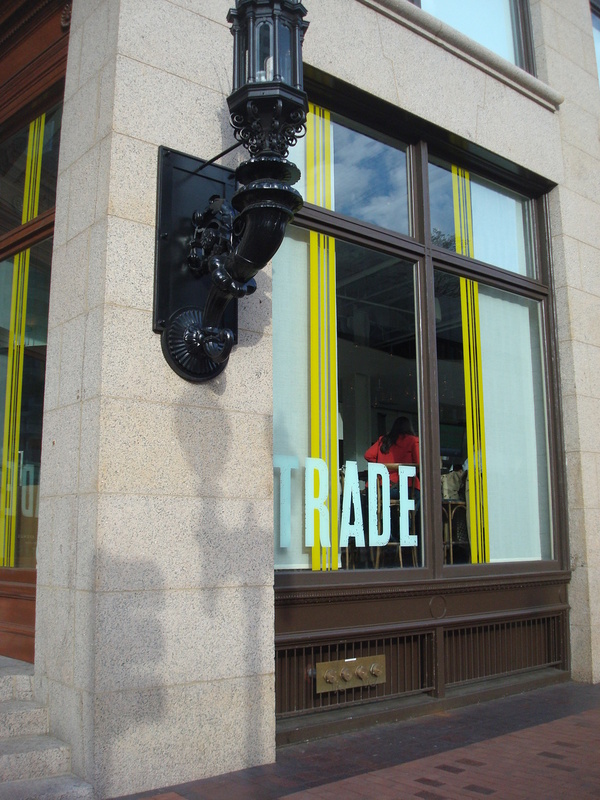 Situated in the bottom floor of the Atlantic Wharf building and overlooking the Rose Kennedy Greenway, TRADE is a mere two blocks from the South Station T stop. The immediate vicinity is a little sparse, populated mostly by office buildings, making TRADE a warm and welcome sight by contrast. Walking up the steps to the restaurant, we found ourselves faced with two mammoth wooden doors that made us feel rather hobbit-esque. The interior is open and quite spacious, with vaulted ceilings, a long marble bar that stretches the length of the room and wraps around the corners, and a good-sized dining area off to one side. TRADE is engulfed by massive windows stretching from floor to ceiling, letting in tons of natural light and giving patrons a fantastic view of the street from pretty much anywhere in the bar. The light from outside, reflected by the mostly white décor, makes for a bright, pristine appearance. As night falls, the scene becomes darker and more intimate, softly lit by subtle bulbs above the bar and a few huge, bell-like hanging lamps. It has what I’d call a chic industrial look – exposed bricks on the walls and ceiling, large steel beams here and there. 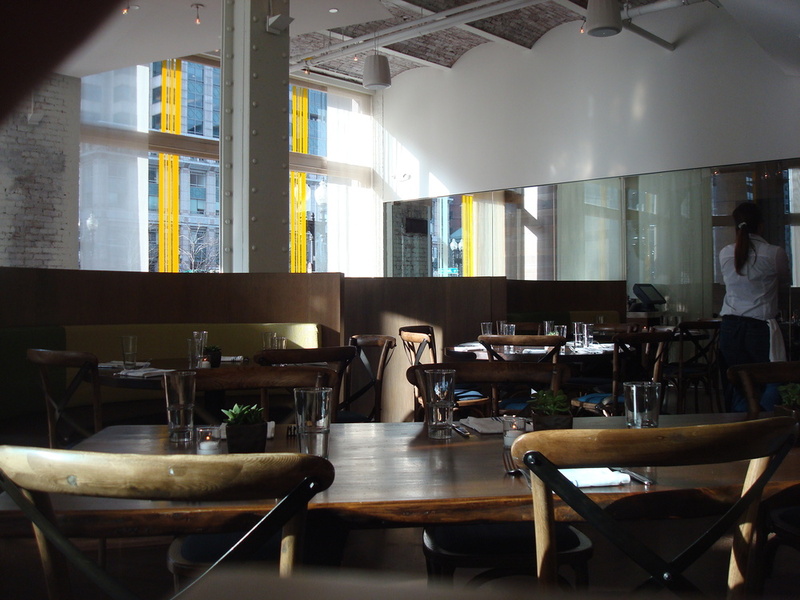 The dining area has a darker décor, providing a nice contrast to the brightness of the bar. Upon walking in, the first thing I noticed was that every seat at the bar was marked with a “Reserved” sign. My first thought was that someone had rented the whole place, but as it turns out, the staff seats you at the bar. I don’t think I’ve ever encountered this – a bar in which you can’t simply walk up and grab an open seat. At first I found it a little off-putting. Then I realized it’s actually a pretty good idea. How many times do you walk into a bar with one or two other people and, even if there are five open seats, find that they’re scattered all over? You end up gathering around one and hoping a sympathetic stranger in the seat next to you will slide down and free up a spot. But here, even though there were at least 20 open seats at the bar at 5:15, the host sat us in a deliberate, calculated manner, which kept things organized and comfortable as more people trickled in. John reveled in the draft beer selections, which included such craft options as Julius Echter Hefe-Weissbier and Delirium Tremens, along with more common offerings like Harpoon and Stella. He opted for Pretty Things Fluffy White Rabbit, replete with fancy glass, and seemed pleased with his decision. Drinks in hand, we turned to the dinner menu before it was whisked away. TRADE’s dinner options are creative and a little unusual, to say the least. They offer a variety of “small plates,” great for yourself or for sharing; flatbread pizzas, made right in the brick oven behind the bar; and succulent entrees like seared half chicken with burnt orange, dates, pistachios, and quinoa. I stuck with the small plates. First up was avocado with green mango-tamarind-peanut chutney. Talk about a brilliant combination of flavors – the sweetness of the mango, the earthiness of the cilantro, the creaminess of the chutney and avocado, and the saltiness of the peanuts...it was like listening to a jazz band at the height of its powers. A week and a half later, I’m still thinking about this culinary work of art. I followed the avocado dish with what sounded like one of the more amusing selections: fried dough with parmesan, prosciutto, and anchovies. Needless to say, this marks the first time I’ve ever ordered fried dough at a restaurant. But this wasn’t your typical carnival fare – it was thin, crispy, and airy, almost the consistency of a flatbread pizza crust. And the toppings imparted so much flavor, the saltiness of the prosciutto and the anchovies playing nicely with the sweetness of the dough. John ordered a flatbread pizza topped with mushrooms, figs, gorgonzola, sage pesto, and walnuts. He deemed it fantastic, and while I have my issues with mushrooms and am not a lover of figs (as a child, I loathed Fig Newtons; as an adult, I also loathe Fig Newtons), even I was truly impressed with the flavors. On the side he got a dish of roasted cauliflower, richly spiced with curry and accompanied by an unidentified but delicious dipping sauce. 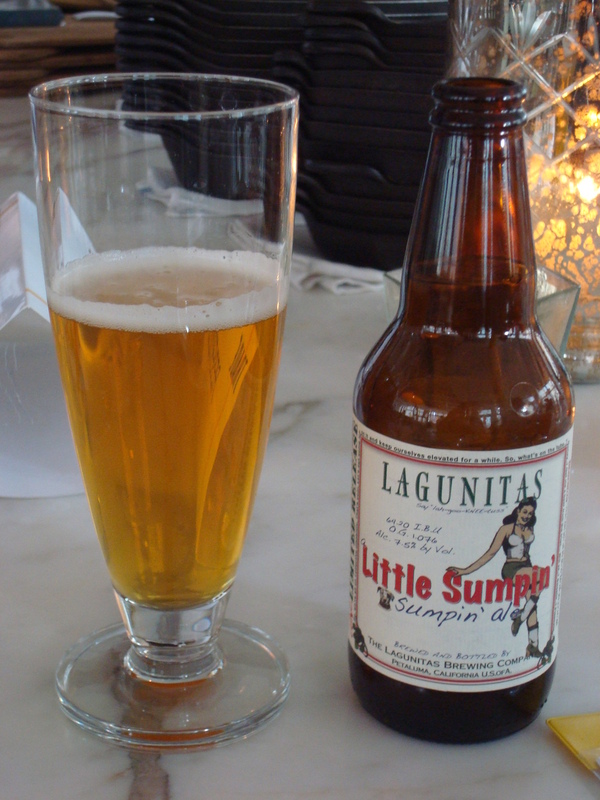 After the Man With No Name, I opted for a beer with a name I knew well – a bottle of Lagunitas Sumpin Sumpin Ale. TRADE’s bottled selection is as intriguing and varied as its draft offerings. There are notable craft options like Lagunitas and Left Hand Milk Stout, oddball varieties like Porkslap Ale, and for reasons I’ll never comprehend, Colt 45. John considers the latter to be an appeal to the hipster crowd. As for my Lagunitas, I’m sure John could give you a detailed rundown of its malt and hop varieties, but you’ll have to settle for my less specific appraisal: it was really good! John shifted into cocktail mode and got a drink called the Russia Wharf – Ketel 1 vodka, Luxardo cherries (which, I suspect, are the same ones I loved so much at Marliave), amaretto, and lime. The cherries provided an earthy, natural sweetness that complemented the amaretto, and the citrus from the lime gave the drink an unexpected zing. After very little debate, we decided on one more round. Agreeing to “take one for the blog,” John ordered the bizarre Porkslap Ale, which, of course, comes in a can. The sight of the waiter elegantly pouring the can of Porkslap into a classic pilsner glass was ironic and comical. I took the more conservative route and went with a bottle of Radeberger Pilsner. You might think I got the better end of that deal, but I didn’t. The Porkslap was actually pretty good. 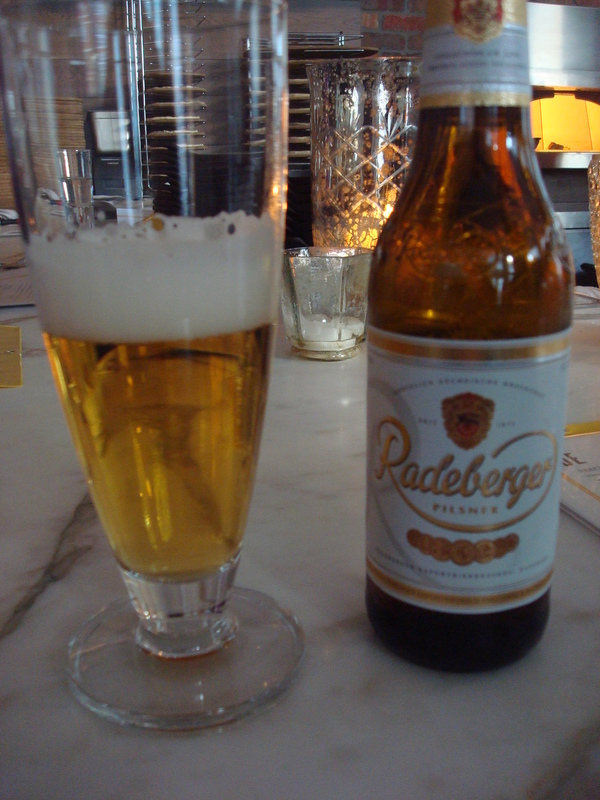 The Radeberger, which I’ve had plenty of times on draft and enjoyed as a basic, dry pilsner, seemed a little off. (John helpfully detected “notes of urine” in the beer’s aroma. It was real fun to drink after that.) I suppose it serves me right for ordering something that conventional when there were so many more compelling options. At that point we were offered a dessert menu. I very rarely get dessert when I’m out, but frankly, I was just so stunned that the waiter was willingly giving us a menu instead of taking one away, I had to at least take a look. 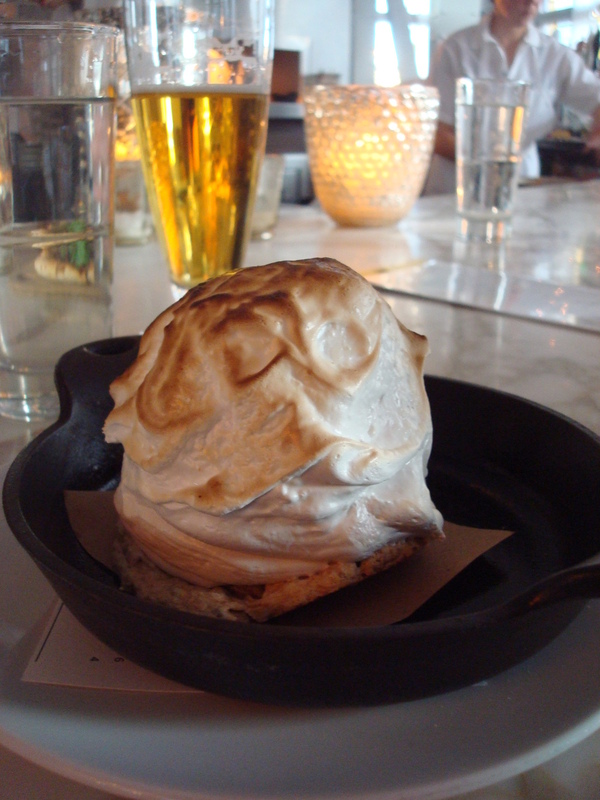 And that’s when I saw that TRADE offers one of the most notoriously difficult to make desserts in the pantheon of decadent after-dinner treats – Baked Alaska. Hikers have Everest. Golfers have a hole in one. Bakers have Baked Alaska, and it brings even accomplished chefs to their knees. If you don’t know, it essentially involves wrapping ice cream in meringue, putting it on sponge cake, and baking it in a very hot oven so that the exterior gets crispy while the ice cream inside remains frozen. I watched as they slid my frozen concoction into the same brick oven they use for their flatbreads, wondering how anyone could really pull this off. The result was perfection. The meringue had hardened outside but was creamy just beneath, and the ice cream that had just been baked in an oven may as well have come straight out of the freezer. I guess my Boston bubble just expanded a bit. TRADE is phenomenal. Incredible food, excellent cocktails, and a solid beer list. That said, I don’t think I’d come here just to drink. Maybe it was the host seating us at the bar, and the fact that a waiter, not a bartender, takes your drink order, but it made the evening seem a bit more formal. Not that the place is stuffy or anything; it actually has a pretty relaxed feel. As John said, it’s kind of like an upscale neighborhood place. But I digress. As good as the drink options are, you’d be a fool to come here and not try the food. The entrees are a little pricey, averaging around $25. That’s certainly not terrible, and if the entrees are as satisfying as the small plates, they’re worth every penny. Still, the small plates are more affordable, mostly around $9. The avocado plate I got probably would have been filling enough on its own (but I couldn’t ignore the fried dough). And if you can share a couple of those small plates with a friend, you’re in business. Prices for the craft beers and cocktails were typical for the area – $6 and $7 for the beers, $10 and $11 for the drinks. For John and me, this was an unforgettable drinking and dining experience. 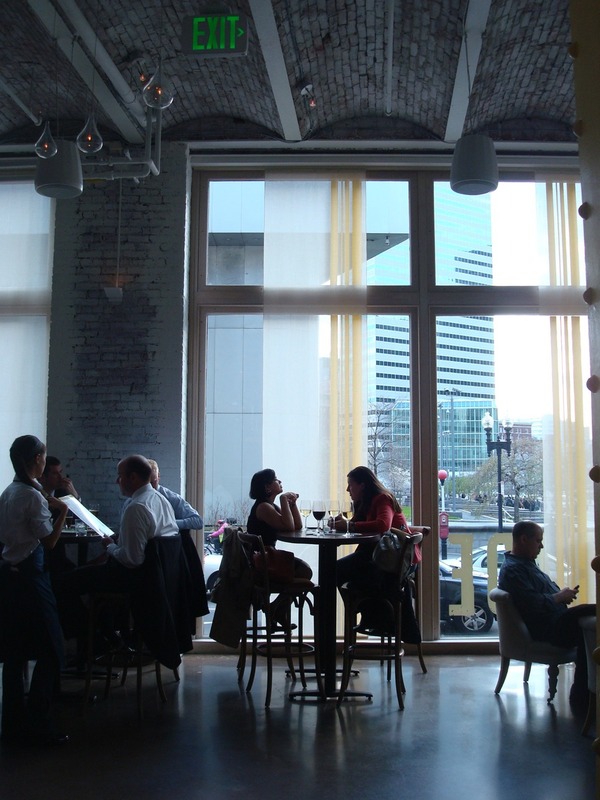 And whether it’s a simply chance to check out an area of Boston you don’t go to very often, or an opportunity to be adventurous with your palate, TRADE offers a refreshing and rewarding change of pace.